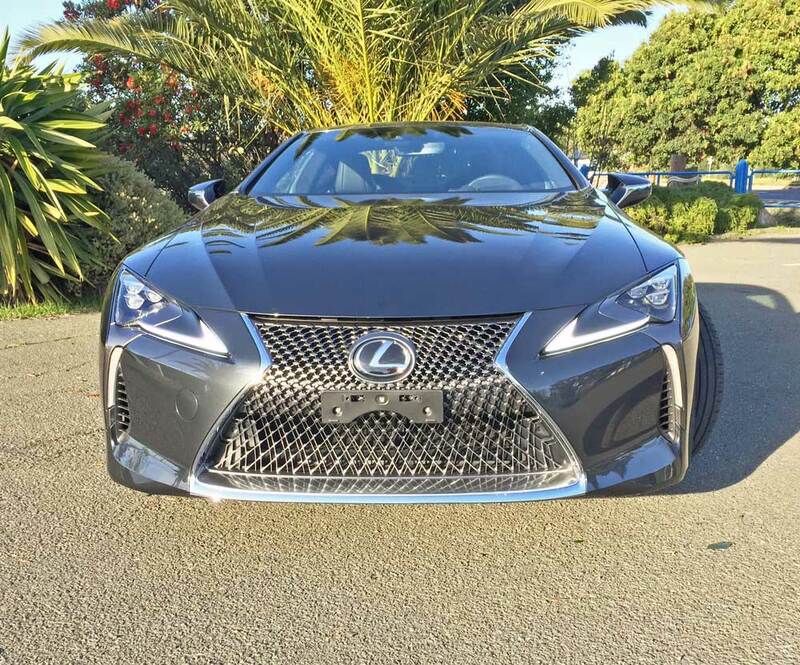 If you were enamored with the expensive limited production Lexus LFA supercar, then you’re sure to love the new 2018 Lexus LC 500 series International Grand Touring Sport Coupes, which are based on the LF-LC concept car. 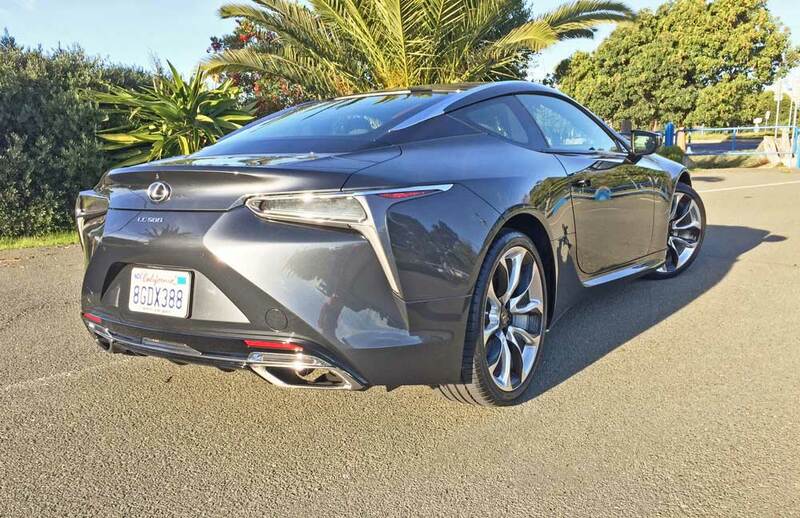 There are actually two versions – the LC 500 powered by a V8 engine, and the LC 500h, a V6 powered Hybrid, and both are based on the GA-L platform architecture. 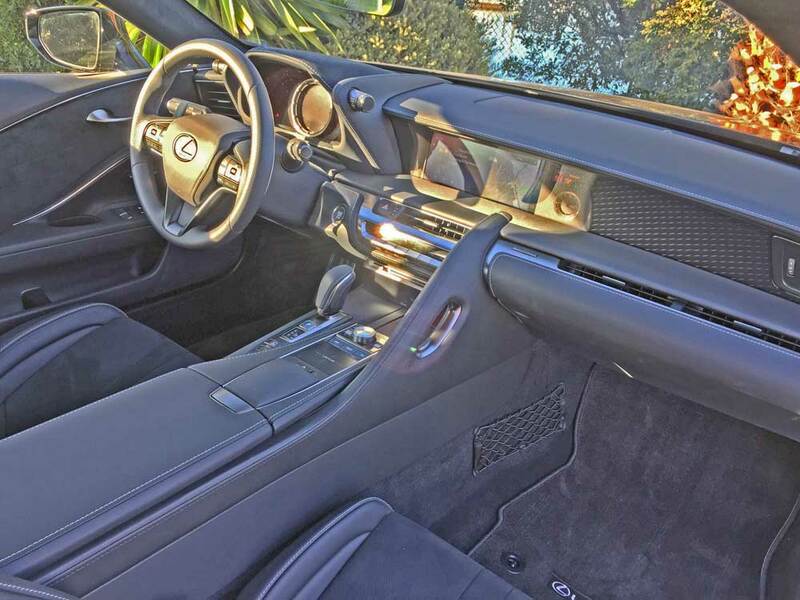 The Lexus LC 500 Coupe is a 2+2 Grand Tourer with rear seat limitations. Propulsion is provided by a 5.0-liter, DOHC, 32-valve, normally aspirated, Dual VVT-I and EFI/D-4S longitudinally front mounted V8 engine that generates 471 horsepower at 7,100 rpm while also developing 396 pound feet of torque at 4,800 rpm. EPA mileage estimates are 16-mpg city/ 25-mpg highway. 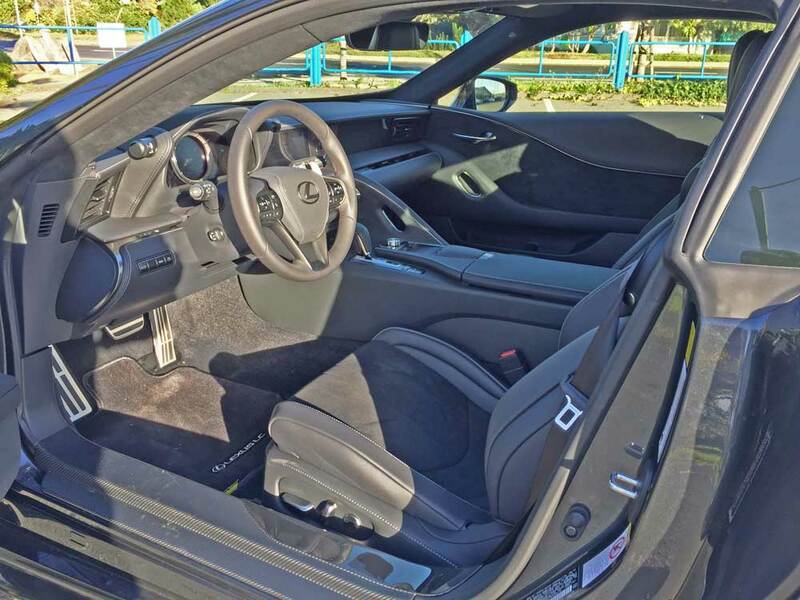 The transmission for the LC500 is a Ten-speed Sport Direct Shift automatic with steering wheel mounted magnesium paddle shifters and manual mode. There is a Torsen® high-capacity, torque-sensing Limited Slip Differential. 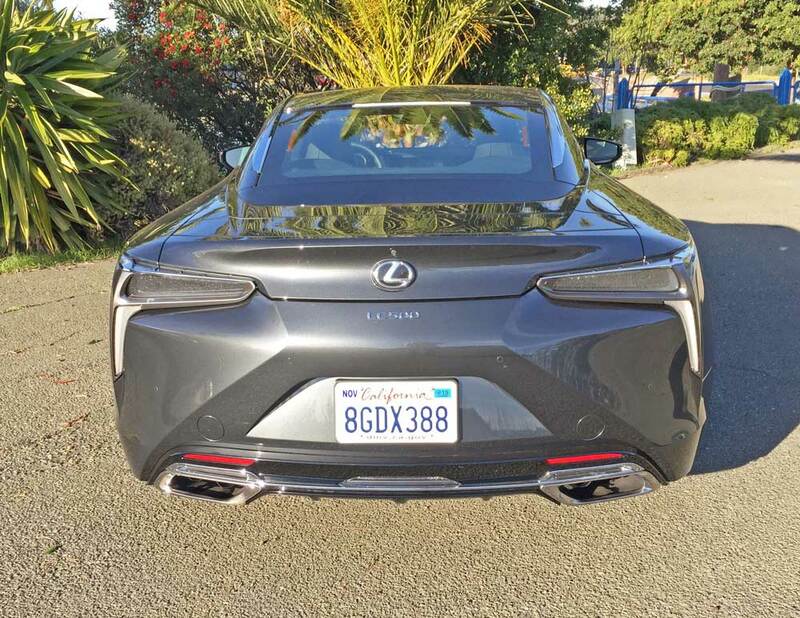 Visually, the Lexus LC 500 and its hybrid sibling, the Lexus LC 500h share the same design and styling cues, the only difference being the specific Hybrid badging. The Hybrid even carries the split rectangular dual exhaust tips. The overall design is boldly expressive and is literally drop dead gorgeous from virtually every viewing angle. It might well be referred to as seductively wrapped technology. Up front is the traditional Lexus Spindle grille, but in a modified and enhanced form that blends with the dramatically sculpted hood, and is flanked by the Polaric Ellipsoid System compact lens LED 3-projector headlamps and lower air intakes. The grille features a progressively graduated mesh pattern, enlarged from top to bottom, with a bright surround trim without a top bar, and the headlamp assemblies form light rows that point to the grille. 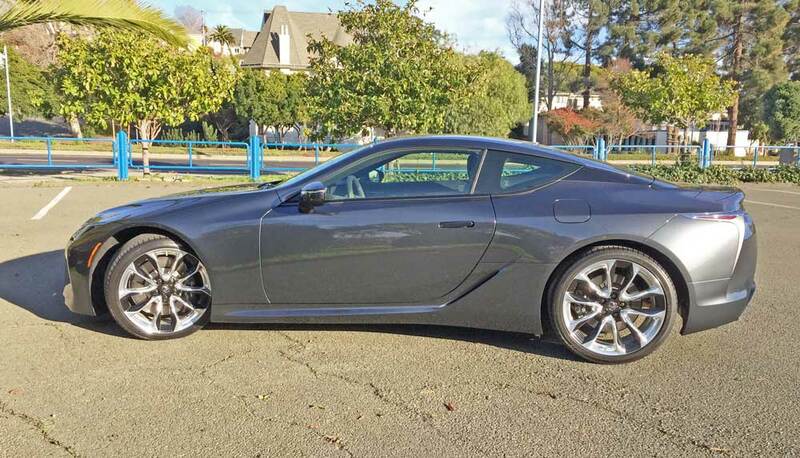 In profile, the Lexus LC500 displays short front and rear overhangs and a roofline that appears to float free from the body, which sits low over the wheels. Both the shoulder and rocker lines sweep gracefully inward, reminiscent of early Coke bottles. In the rear, the bold new three-dimensional tail lamps accentuate the car’s low and wide stance, flowing around to the sides. There is an integrated spoiler lip just ahead of an active rear spoiler. Inside the cabin is a cockpit-like driver zone with dual “Oh s—t” grab handles for the front passenger for stabilization during spirited maneuvers. Controls and switchgear are optimally placed for ease of use. Even the non-sport seats are highly supportive and comfortable, and the driver’s seating position is ideally located to achieve a properly centered operational point. 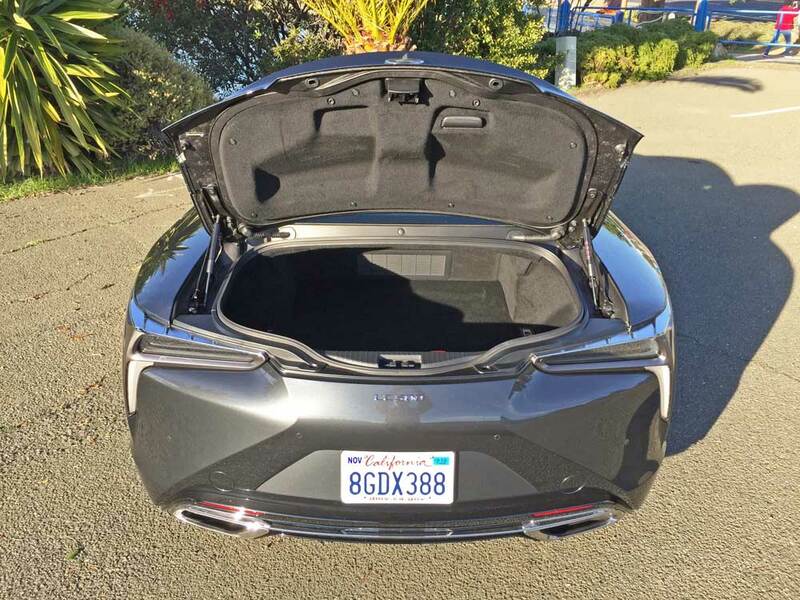 In terms of body rigidity, the new LC 500 is even stiffer than that of the LFA supercar. Several performance enhancement Packages are available as are a host of stand alone optional features. Connectivity and Infotainment are provided through Lexus Enform. Takumi (translated as Master) craftsmanship is evident throughout the Lexus LC 500. 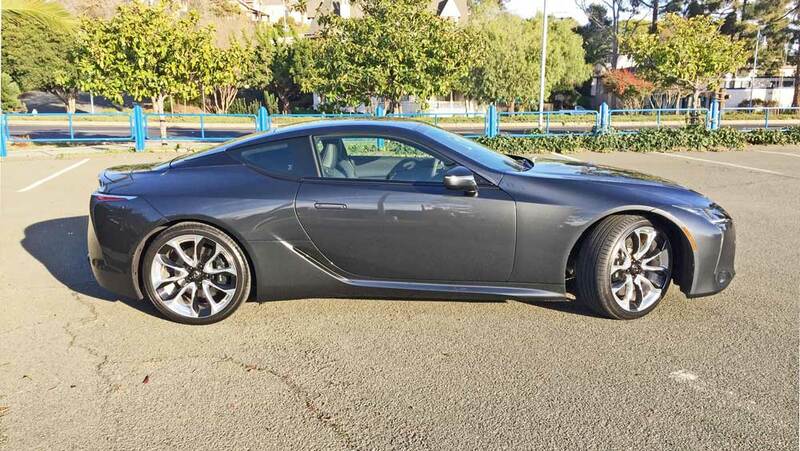 My test LC 500 wore a Smoky Granite Mica metallic exterior and featured a Black interior, with exemplary fit and finish. The base sticker read $ $92,200., which rose to a final tally of $105,345 after factoring in options and the Destination charge. The list of equipment and features that come as standard is considerable, but too lengthy to include here. As already stated, the 2019 Lexus LC 500 2+2 performance Coupe merits Lexus flagship status. It is stunningly beautiful with its futuristic design appeal. 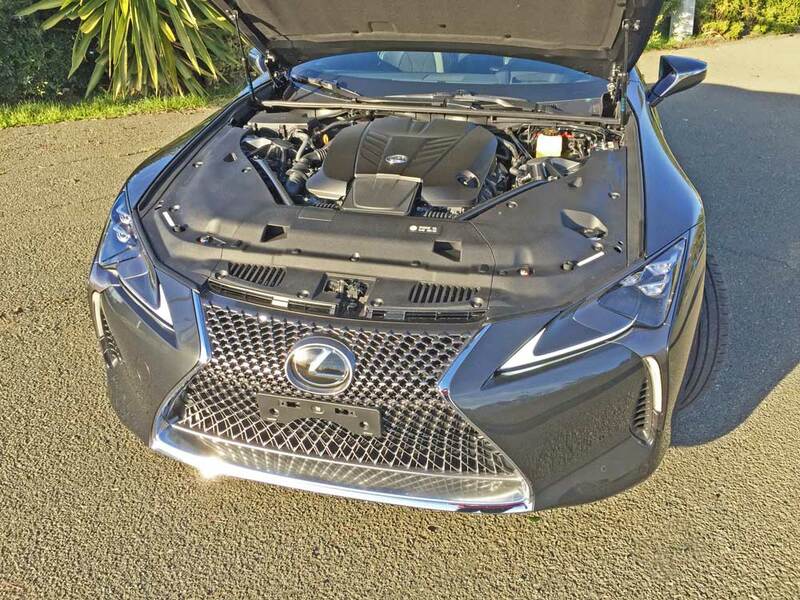 In terms of its performance attributes, the V8 power of the LC 500, unquestionably moves it to the top rung of the performance ladder, although, it‘s only three tenths of a second quicker from 0-60 mph than its LC 500h hybrid stable mate, and its top speed capability is only 13 mph faster making the extra cost of the hybrid difficult to justify for some. The car just wants to go fast. And utilizing the paddle shifters delivers a pleasingly raucous note, blipping the throttle during downshifts, when set in the sport + setting of the Drive mode Select knob. The interior ambience showcases not only a smoothly flowing elegance, but delivers a comfortable and most supportive ride quality even during highly spirited maneuvers. Despite its 2+2 designation, don’t plan lounging leisurely in the minimal rear seat, especially behind tall front seat occupants. The driving dynamics are superb, providing a solid, planted feel, with spot-on steering responsiveness and road-holding grip. An optional Sport Performance Package includes Active Rear Steering along with a Variable Gear Ratio System, an Active Rear Spoiler, Alcantara headliner and Carbon Fiber scuff plates. The 2019 model Lexus LC 500 2+2 performance sport coupe provides entry into an exclusive class of luxury super sports cars. Buyers will be able to “Experience Amazing” enveloped in seductive technology according to Lexus insiders. Kudos to Toyota/Lexus chief Akio Toyoda for his meaningful vision and guidance in bringing this super car to fruition. Engine Type and Size: 5.0-liter, DOHC, 32-valve, naturally aspirated V8 with Dual VVT-I. paddle shifters and manual mode. Drive Train: Longitudinally mounted front engine / Rear-Wheel Drive with available Limited Slip Differential and Active rear wheel steering. 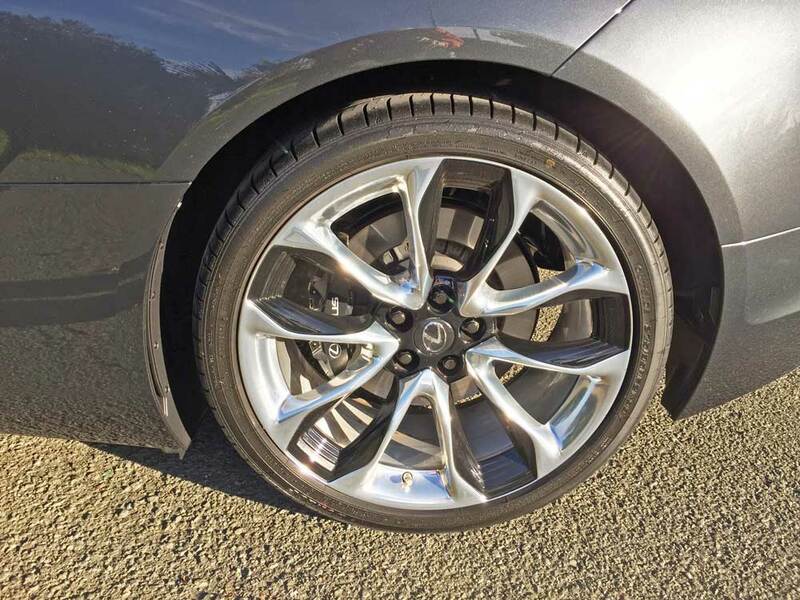 Tires: Dunlop Sport 245/40 RF 21 95Y front / 275/35 RF21 95Y mounted on 5-“V”—spoke polished forged alloy wheels. Width: 75.6 inches – w/o mirrors. Height: 53.0 inches – unloaded. Turning Circle: 17.7 ft.(17.4 w/Active Rear Steering).